The Junin Region includes highlands as well as Amazonian jungle. To the west, at the border with the Department of Lima, the mountains are steep and snowy. Towards the east, he landscape is made de glacial valleys and high altitude plateaus. At the rim de the jungle, deep narrow gorges and mist forests abound. 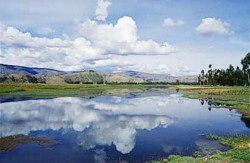 The city de Huancayo is located in the Mantaro River valley, one de the most fertile valleys in the central Andes. Its inhabitants make a living from agriculture, cattle raising, trade, and tourism. Long ago, the area was the realm de the Huancas, a tribal enemy de the Incas who according to legend were finally subjugated by Pachacutec after ferocious resistance. Half an hour away from the city de Huancayo, in the province de La Convencion, you come across the Convent de Santa Rosa de Ocopa. Franciscan missionaries built it in 1725 for the purpose de establishing a base for evangelizing the jungle peoples. There are still preserved old, Colonial cloisters and an impressive library with more than 25,000 volumes. From the city de Jauja, the first capital de the Peruvian Vice-royalty, you can visit the lovely Paca Lake. The city de Tarma, the city de flowers, is celebrated for its attractive countryside and excellent climate. However, the department is not only mountainous. It also contains jungle valleys with splendid countryside and typically tropical climate like Satipo and Chanchamayo, where the cities de San Ramon and La Merced are located. The department is also home to the Chacamarca Historic Sanctuary and the Junin National Reserve, which protects the second largest lake in Peru where the Junin grebe lives, a bird nearing extinction.